WELLINGTON, N.Z. 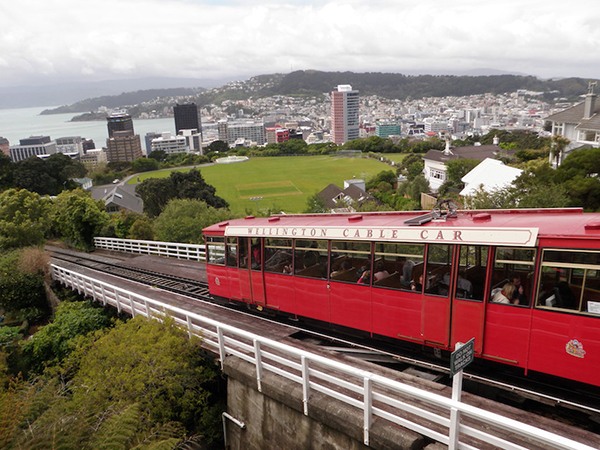 – The shiny red Wellington Cable Car is slightly reminiscent of the Lookout Mountain Incline Railway in Chattanooga, Tenn., if your brain will draw parallels between the South Pacific and the Tennessee River. Wellington Cable Car. Image by Tom Adkinson. The cable car’s lower station is in the heart of the city, which is New Zealand’s capital, and the upper station is a 10-minute ride away in the suburb of Kelburn. In between are panoramic views of Mount Victoria and Wellington’s harbor. After a ride up, you can ride back down, but you also can take a pleasant walk back to town that starts with the Cable Car Museum and includes the Wellington Botanic Garden. Because seasons are reversed in the southern hemisphere, Wellington is headed into autumn, while Chattanooga is watching spring emerge. Wellington’s high temperatures will be in the mid-50s for the next four months.